Developed by David Akers in 2008 the Fishpipe was invented as an answer to all the queries they received from around the world “we love the OGO ride, but we just don’t have the space”. 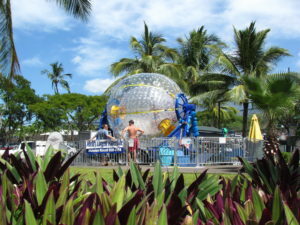 The ride experience is similar to that of rolling down the hill in a giant inflatable ball. We like to describe it as similar to riding the world’s longest rotating water slide. The Fishpipe is the perfect addition to existing water parks, swimming pool complexes or luxury resorts. You order it, we package it, ship it and assist with installation anywhere in the world! Up to 3 riders at a time enter into the Fishpipe barrel; we add 75 litres (20 gallons) of water and then spin the barrel at up to 45 revolutions per minute. The water makes it so slippery inside that riders don’t get spun around, but stay sliding in the water in the bottom of the barrel. 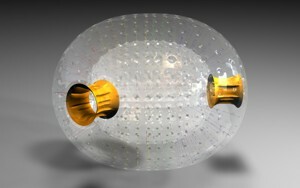 The Fishpipe consists of a steel frame suspending an inflatable barrel. The Barrel is rotated in place at up to 45 rpm by an electric motor and some clever electronics. Our water system removes water from the barrel after each ride, cleans and filters it ready to pump in fresh water for the next ride or alternatively the Fishpipe can be connected to existing water park filtration systems. 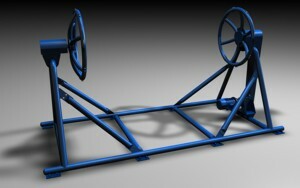 Speed and length of ride time can be adjusted to suit operating environment to increase throughput as required. The frame of the Fishpipe is constructed with heavy duty metal pipe, welded and bolted together. The frame is 5.2 metres (17 feet) long by 2.3 metres (7.5 feet) wide and the entire unit weighs about a tonne. The frame, motor and gearbox, electronics, etc are assembled locally and then we put it all together and test run everything from our factory. 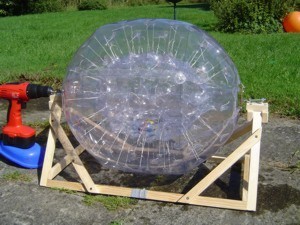 The inflatable Fishpipe barrel is big enough for 3 people to stand inside. You climb in through the door hole which is then zipped closed to ensure you can’t fall out, and there is an air hole at the end which remains open bringing fresh air to you while you ride.